I just spent ten weeks with these fine future family therapists. It’s pretty cool to have the same people in every class, about twelve hours a week, and all doing the same assignments and reading. (About 30 hours of reading a week and between 5 and 20 hours of writing a week.) I think I’m getting to know them pretty quickly. It’s a little like how I felt doing my honors thesis in the psychology department with a bunch of people I would be graduating with, but I only got a year with them, and only had a couple of them in each of my various classes–the CFT masters is on a set track, where two undergraduates in psychology might only have taken a couple classes in common. I’m getting something like 21 months with this cohort, and spending a lot more time with them throughout. 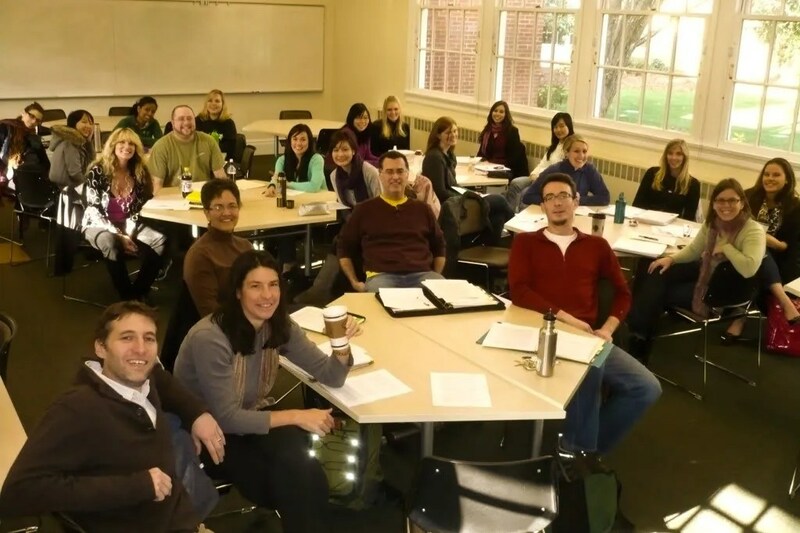 This is them just before I gave my presentation, “Intervention at the Level of Systems versus Individuals,” on our last day of Family Theory class. We were all pretty exhausted–on the home stretch. Marc, our instructor, is in the lower left.